The e-commerce giant's ambitions seem to have no limits. Here's a look at the implications of three stories involving Amazon.com (AMZN - Get Report) that are in the news. In Amazon's early days, it wasn't hard to find bears who claimed the company was just the digital version of a mail-order catalog retailer. One or two of those former bears may have chuckled upon seeing a Wednesday Bloomberg report about Amazon's holiday-season marketing plans. The news service reports that Amazon plans to publish a holiday toy catalog that it will mail to millions of U.S. households, and also distribute via Whole Foods stores. No word on exactly how many catalogs Amazon will print, or how it plans to do its targeting. Focusing on Prime households that are known by Amazon to be purchasing kids' products would be a logical move. As Bloomberg notes, the recent collapse of Toys R Us, which did $6.5 billion in sales last year, gives Amazon an incentive to up its toy-related marketing spend. In addition, Amazon could find a way or two to link its catalog with its mobile app. For example, by embedding QR codes within the catalog that (upon being scanned by a phone's camera) can pull up the product page for a toy within the Amazon app. Or -- given that Amazon has begun using Apple's (AAPL - Get Report) ARKit platform to let consumers see how various products would look within their homes -- by letting a 3D rendering of a toy pop up within the app. Separately, Amazon has announced that this year's Prime Day (set for July 16th and 17th) will actually be a day-and-a-half. A year after upping Prime Day's length by 6 hours to 30 hours, Amazon has upped it to 36 hours. It's not hard to understand why: Last year's Prime Day was a phenomenal success. 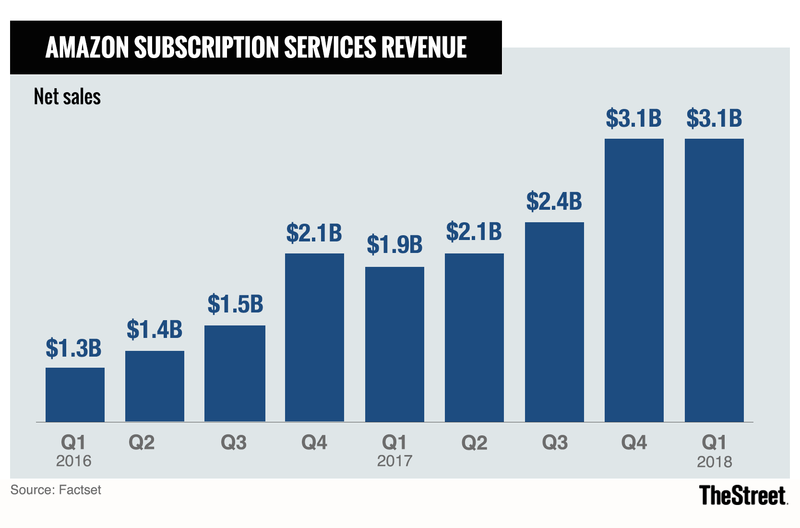 Sales rose 60% relative to 2016's Prime Day, and Amazon indicated on its Q3 earnings call that the day even drove a surge in Prime sign-ups in the U.S., India and elsewhere; the company's subscription services revenue rose 59% annually in Q3, up from Q2's 53%. Prime Day has become a pretty valuable Prime customer acquisition (and perhaps also retention) vehicle. And with Amazon less than three months removed from announcing it's hiking Prime's U.S. annual fee by $20 to $119, the company has a little extra incentive this year to make heavy use of it. Amazon's efforts to integrate Whole Foods with the rest of its empire seem to be going pretty well. The company began selling Echo and Fire devices at Whole Foods stores last fall, and has followed up this year by giving Prime members 10% discounts on select Whole Foods items and supporting free 2-hour delivery ($35 order minimum) for Whole Foods orders in over a dozen cities, through its Prime Now rapid-delivery service. True to form, Amazon is also making Whole Foods a part of its Prime Day efforts. The company promises "deep discounts on select popular [Whole Foods] products," with Prime members able to get an extra 10% off sale items. In addition, Amazon will give users of its Prime Visa credit card 10% back (twice as much as usual) on up to $400 worth of Whole Foods purchases from July 14th to 17th. However, there have also been signs of friction between Whole Foods and its new parent. There have been a number of stories about empty store shelves this year (Amazon has promised to fix the issue), as well as a few about employee frustration with a cumbersome inventory-management system that's blamed for food shortages and led some workers to fear for their jobs. In addition, The Wall Street Journal recently ran a column noting that product suppliers are upset at the revised contract terms that Whole Foods is offering them, and that employee layoffs have sparked calls for unionization. "A lot of our members are perplexed, just completely dumbfounded," the head of a supplier organization is quoted as saying about new fees Whole Foods is imposing on suppliers. None of this is necessarily reason for alarm. But it does serve as a reminder as to why many (myself included) were worried at the time the Whole Foods acquisition was announced last year that the differences between Amazon's hard-charging, data-obsessed, corporate culture and Whole Foods's more relaxed, consensus-based culture would cause some tension. Six months after Amazon opened its first cashier-less Go convenience store near its Seattle HQ, GeekWire has received confirmation that Amazon plans to open a second Seattle Go Store this fall. Whereas the original Go store takes up 1,800 square feet, permit filings indicate the second Seattle store will be roughly 3,000 square feet size. That last detail is pretty important. Even as the original Go store has racked up plenty of positive reviews, there have been questions about how well the technology powering it (a mixture of cameras, sensors and software) would work within a larger store. Amazon has already said it has no plans to deploy Go's technology within Whole Foods stores -- it might make limited sense there anyway, since consumers buying dozens of items will often want a cashier to bag them. But there's quite a lot of middle ground between the first Go store's modest footprint and the 40,000 square feet claimed by the average Whole Foods store. Go stores are also being planned for Chicago and San Francisco. Though Microsoft ( MSFT - Get Report) was recently reported to be working on an alternative system that it's pitching to Walmart ( WMT - Get Report) and other retailers, Amazon, which began working on Go in 2012, appears to have a healthy lead when it comes to making the cashier-free store concept a commercial reality. Amazon.com, Apple and Microsoft are holdings in Jim Cramer's Action Alerts PLUS member club . Want to be alerted before Jim Cramer buys or sells AMZN, AAPL or MSFT? Learn more now.